The Obama administration’s record-setting arms deals with Riyadh have strengthened extremists and led to greater regional instability. On August 9, the State Department approved the latest major US weapons sale to Saudi Arabia, mainly to replace tanks that the kingdom has lost in its war in Yemen against Houthi rebels and allies of the former president. The $1.15 billion deal highlights the Obama administration’s deepening involvement in the Saudi-led war, which has escalated after four months of peace talks broke down on August 6. Since then, warplanes from the Saudi-led coalition have bombed a Yemeni school, a hospital run by Doctors Without Borders, and a potato-chip factory, killing more than 40 civilians, including at least 10 children. The deal for the Saudi army to buy 153 Abrams tanks, hundreds of machine guns, 20 heavy-tank recovery vehicles, ammunition, and assorted other weapons is the latest in a series of arms sales by the United States—and, to a lesser extent, Britain and France—to the kingdom since it launched its war against Yemen in March 2015. In addition to providing intelligence assistance, Washington has rushed billions in smart bombs and other war matériel to help the Saudi air force continue its bombing campaign. Indeed, some of the Saudi weapons systems are so complex and dependent on US spare parts that they would be grounded without American assistance. Despite its supposed turn away from Gulf allies—and a pivot toward Iran, underscored by the considerable political capital expended to reach last year’s nuclear deal—the Obama administration has dramatically ramped up arms sales to Saudi Arabia and other Arab allies in the Gulf. Since 2010, the administration has authorized a record $110 billion in military sales to Saudi Arabia, according to the Congressional Research Service. The planned sales include dozens of advanced F-15 fighter jets, Apache attack helicopters, naval vessels, Patriot missile-defense systems, hundreds of armored vehicles, and thousands of missiles, bombs, and other munitions. (Some of these weapons, such as the large number of F-15 jets, could take years to be manufactured and delivered, so the final value of the contracts could be different than those authorized by the administration.) Over the past six years, Obama and his aides have concluded deals for nearly $48 billion in weapons sales, according to a Reuters investigation of Saudi military spending—triple the $16 billion in sales under the George W. Bush administration. In other words, Obama has not fundamentally changed the status quo between Saudi Arabia and Washington. While Saudi rulers frequently criticize Obama for “abandoning” his traditional allies in the Middle East, and shifting US foreign policy to be more friendly toward Iran, his administration has sold more weapons to the kingdom than any previous US president. Obama has publicly criticized Saudi Arabia and its leaders more frequently than some of his predecessors, and he has also reduced direct US involvement in the Middle East, before increasing it again gradually in the US war against the Islamic State in Iraq and Syria. Obama also resisted calls to intervene more deeply in Syria and to send a larger contingent of American troops to Iraq. Saudi leaders were particularly irate after Obama suggested in an interview with The Atlantic magazine’s Jeffrey Goldberg that they should figure out ways to “share the neighborhood” with Iran. The arms sales buttress the more aggressive Saudi foreign policy of the new king, Salman, and his inner circle. More broadly, the arms sales buttress a more aggressive Saudi foreign policy being spearheaded by the new king, Salman, and his inner circle. For decades, Saudi Arabia pursued a largely behind-the-scenes foreign policy that benefited from economic expansion fueled by booming oil prices. The previous Saudi king, Abdullah, who died in January 2015 after two decades in power, presided over a proxy war with the kingdom’s regional rival, Iran—a series of battles in Iraq, Syria, Yemen, Bahrain, and Lebanon—that have shaped the Middle East since the Bush administration invaded Iraq in 2003. Even so, Saudi foreign policy was more cautious and less prone to military intervention than it is today. The kingdom relied on the United States to guarantee its security, and worked mainly through proxies and checkbook diplomacy to advance its interests. Instead of relying on US military intervention and battling Iran through proxies, Salman and his advisers are overturning the old regional order. The new monarch launched the war against the Shiite Houthi rebels after they and their allies—including elements of Yemen’s military loyal to Ali Abdullah Saleh, the ousted ex-strongman—had taken control of much of Yemen. The Saudis and their Gulf Arab allies say they want to restore Yemen’s current president, Abdu Rabbu Mansour Hadi, into power. 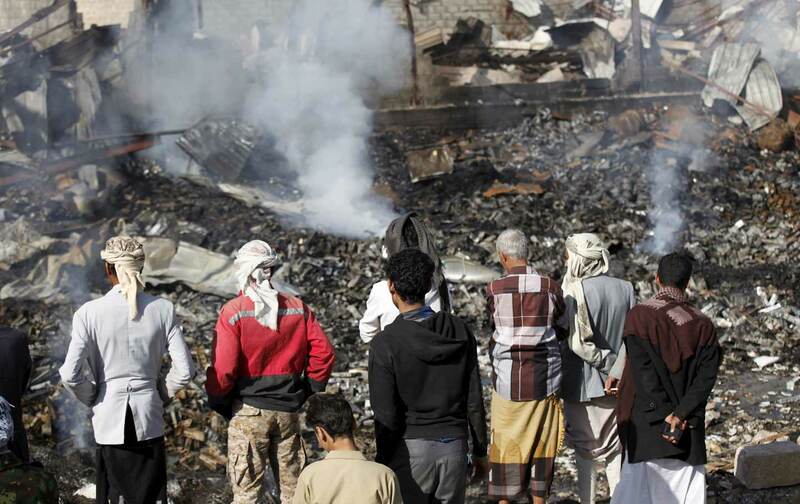 But the conflict in Yemen is complex, with a shifting set of alliances. Saleh was a longtime Saudi ally, who was ousted after the Arab uprisings of 2011 spread to Yemen. Hadi replaced him in 2012 under a deal essentially brokered by Riyadh. But Saleh still retains support among segments of the Yemeni security forces, and those troops helped the Houthis capture the capital, Sana, and move south toward Hadi’s stronghold of Aden. Saudi leaders accused the Houthis of being Iranian proxies who were threatening the kingdom’s southern border. (At the start of the war, the Houthis’ connection to Tehran was tenuous, although there are now reports of closer cooperation with Iran.) Salman appointed his 30-year-old son as defense minister and deputy crown prince to oversee the Yemen campaign. The war is popular with the Saudi public, despite the economic cost and mounting civilian casualties in Yemen. By June, the United Nations estimated, the war had killed nearly 6,500 people, injured more than 31,000, and internally displaced 2.5 million Yemenis. Salman also increased Saudi support for Sunni rebels fighting Bashar al-Assad’s regime in Syria—another signal that the kingdom is no longer as reliant on the United States and is taking a more assertive role to counter what it views as Iran’s growing regional influence. (Iran is much more heavily involved in the Syrian war, sending thousands of troops and Shiite volunteers to fight alongside Assad’s soldiers and propping up the regime with money and oil.) But Salman and his inner circle have shown they’re more willing to undertake military adventures and to directly confront Iran, even as Riyadh deals with internal problems such as youth unemployment and radicalization by Islamic militants, and struggles financially due to the global collapse in oil prices. By 2015, the kingdom had become the third-largest military spender in the world, after the United States and China. Against the backdrop of increased Saudi military spending and more aggressive foreign policy, Obama has publicly preached a kind of tough love to the kingdom—signaling to the Saudis that he won’t commit US military resources to reflexively support them against Iran. He has also chided Saudi leaders for their singular focus on Iran, urging them to focus on internal problems. The kingdom, for example, is facing a “youth bulge”: more than half of the country’s 20 million citizens are under the age of 25. Two-thirds of the population is under 30. Most troubling, the estimated unemployment rate for Saudis aged 15 to 24 is about 30 percent. Obama’s comments angered the Arab monarchs, including the leaders of Saudi Arabia, the United Arab Emirates, and Bahrain, who decided to send lower-level officials to a Camp David summit organized the following month by the Obama administration to ease Arab fears ahead of Washington’s final push for a nuclear deal with Iran. But Obama was trying to initiate a difficult conversation with US allies—a discussion that got drowned out by which leaders had snubbed Obama by skipping the summit. These public spats have contributed to the perception that Saudi-US relations are at their lowest point in decades. But, despite Saudi anger and public opinion, the bickering and hurt feelings did not prevent the dramatic increase in arms sales to the kingdom. Saudi Arabia is now, by far, America’s largest foreign military sales customer, as the State Department boasts. The Senate has passed a bill that could hold Saudi leaders responsible in US courts for the 9/11 attacks. In the United States, public anger and criticism of the kingdom has been rising, even as Obama ramped up arms sales—and US intelligence and logistical assistance that is crucial for Saudi Arabia to conduct its war in Yemen. Members of Congress are pushing through a bill, which has already passed the Senate, that would allow the Saudi leadership to be held responsible in US courts for the September 11, 2001, terrorist attacks, if victims’ families can prove that any Saudi officials played a role in financing or assisting the hijackers. (Fifteen of the 19 hijackers on 9/11 were Saudis.) Obama has said he would veto the bill, and Saudi leaders are threatening to sell off up to $750 billion in US assets if the law is passed. But there has been little resistance in Congress to the administration’s record increase in arms sales to the kingdom. Congress has the power to review and delay foreign military sales, usually within 30 days of their approval by the State Department. Some in Washington fear that, if Congress or the administration delay or scrutinize weapons sales, Saudi leaders would take their business to Russia, China, and Europe. But the Saudi military is highly dependent on US weapons systems and training, and it would take years for it to transition to foreign systems. Since the 1940s, the House of Saud has managed a tenuous pair of alliances: one as a political partner with Wahhabi clerics who vilify America and the West, and the other as an ally and major oil supplier to the United States. The kingdom sits on one-fifth of the world’s known oil reserves and is the second-largest foreign oil provider to the United States. For decades, Riyadh used its leverage within OPEC to keep prices and production at levels that satisfied Washington. In return for ensuring a steady global supply of oil, successive US administrations supported the Saud family and provided military assistance whenever aggressive neighbors like Iraq have threatened the kingdom. In 1990, when Saddam Hussein invaded neighboring Kuwait, the United States sent half a million troops to Saudi Arabia and used it as a base from which to drive the Iraqis out of Kuwait. About 5,000 US troops remained in the kingdom at the Prince Sultan Air Base, and the high-tech command center served as headquarters for US air strikes on Afghanistan in 2001. The American military presence on Saudi soil enraged Islamist radicals, who decried the Sauds’ decision to allow “infidel” Western forces into Islam’s birthplace. Osama bin Laden was among those who turned against the ruling family in 1990, and accused the House of Saud of straying from Islam. Of course, the United States bears a significant part of the blame for this dysfunctional relationship. Many Washington policymakers value the stability of the Saudi regime above all else, and for decades they have been willing to turn a blind eye to the ruling family’s excesses and its support for Wahhabi fanaticism. Today, Saudi Arabia’s war in Yemen is breeding another kind of extremism, allowing Al Qaeda in the Arabian Peninsula—perhaps the most dangerous of Al Qaeda’s offshoots—and Islamic State’s affiliates to capture new territory. As the war grinds on and civilian casualties mount, Murphy, the war’s leading opponent in the Senate, has become more critical of the Saudi campaign—and the Obama administration’s support for it. “There’s an American imprint on every civilian life lost in Yemen,” he told CNN on August 16, after the Saudi coalition bombed a hospital in northern Yemen run by Doctors Without Borders. “Why? Well it’s because although the Saudis are actually dropping the bombs from their planes, they couldn’t do it without the United States.” Thanks to US weapons, intelligence, and logistical help, Saudi Arabia is adding to more war and instability in the Middle East.